Staff’s recommended route for the Eldo-to-Walker trail consists of trail segments N1, N2, and N4 (click on the map to view the report with the full-sized image). On November 27th, 2018, a three agency working group consisting of Boulder County Parks and Open Space (BCPOS), City of Boulder’s Open Space and Mountain Parks Department (OSMP), and Colorado Parks and Wildlife (CPW) recommended that a trail be built from Eldorado Canyon State Park to Walker Ranch on the north side of Eldorado Canyon from Eldorado Springs to Walker Ranch (the “Eldo-to-Walker” trail). While the Eldo-to-Walker trail is of interest to many people in its own right, we are interested in it because it is the last segment needed to develop the Indian Peaks Traverse (IPT), a 60+ mile, non-motorized, back country trail connecting Boulder to Winter Park. To be clear, the IPT has not yet been approved by any land management agency, but a grassroots group of hikers, trail runners, backpackers, conservationists, and mountain bikers are working toward making the IPT a reality. Approval of the Eldo-to-Walker trail will complete the land manager permissions necessary to create an iconic trail experience that we can all enjoy from our back doors. The Indian Peaks Traverse uses many existing trails (black dashed lines), but also needs a few remaining unbuilt sections (green dashed lines). Eldo-to-Walker is the last trail segment that has not received land manager permission. Note the trail on this map was conceptual and drawn before the current recommendation by staff (figure above), which provides an accurate alignment. Click to view a larger version. Of course, there are still many challenges left to address. While we understand that the three agencies probably had a tough time coming to agreement on the issues within the scope of the feasibility assessment, we believe that there are several critical issues that were not within scope that should be discussed now to ensure that all interests are heard and respected and that good decisions are made in the coming months. You can see more about the big issues before staff made this recommendation here. First, it is worth noting that staff’s proposed decision makes an important, but implicit, tradeoff by selecting a trail alignment on the north side of the canyon that will have fewer environmental impacts, but will also be a lesser recreation experience. We accept staff’s decision because putting people on a south side alignment would have introduced human use into an area where people have not historically recreated or traveled. Our community has strong environmental values that we collectively support. However, selecting the lower environmental impact north alignment does not allow for separation of use types (as the south side could have), nor does it provide a loop trail from Eldorado Canyon State Park (which a south side alignment would have enabled). In part because of this tradeoff, we believe that it is crucial to discuss some of these and other issues possibly associated with this trail today—before the staff recommendation is discussed by the Open Space Board of Trustees (February 13th) and the County Commissioners (sometime in March). The Eldorado Canyon State Park management team and residents of the town of Eldorado Springs have raised concerns at the open house and through other community forums that should be seriously addressed. We attempt to identify some of those issues below and propose some solutions that we hope will become part of the conversation in the coming months. This is certainly true. At peak visitation times, the park reportedly has a line to get in that can take up to two hours to clear. This leads to upset park goers, unhappy Eldorado Springs residents, stressed state park staff, and competition for scarce parking for the Eldorado Springs pool. However, beyond the first short stretch of each trail in the park, there is rarely a crowding issue on the trails themselves as the trails are not the reason picnickers or climbers come to the park. Most trail users are climbers accessing specific routes or picnickers walking only a short way, typically quite close to the trailhead. Climbers in particular rarely if ever go beyond the Rincon turn-off of the Eldorado Canyon Trail, and thus would probably never use the new proposed parallel trail. Importantly, the IPT would not likely increase these problems. No mountain biker is likely to wait in their car for 2 hours, when they can simply park further away and ride past traffic to get into the state park. The same holds true of trail runners who can park further away and get in a nice warm up before beginning the ascent up the north side of the canyon. Nevertheless, we offer the following solutions, hoping this process can ease existing crowding problems at the park. Solution A: Build an extension to the “streamside” trail. Much of the concern about crowding has to do with difficulty in accessing trailheads, picnic areas, and climbing routes. There is currently a short trail on the north side of South Boulder Creek starting at the park entrance at the east terminus of the park that acts as a climbing route access trail. The state park is exploring upgrading that trail and extending it west to the visitor center at the west terminus of the park. Such a trail would immediately become the most attractive feature of the park (at least for non-climbers), would increase trailhead and picnic area accessibility, would provide an easy trail alternative for pedestrians from the park visitor center, and reduce conflict from pedestrians on the road with cars. 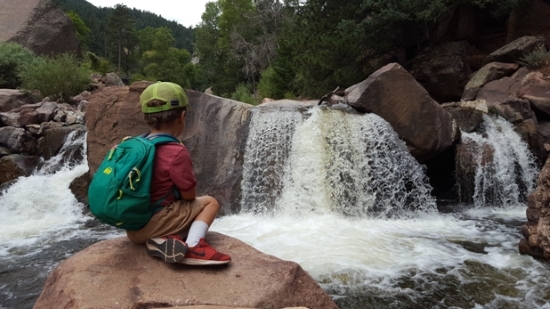 Since Boulder County and the City of Boulder have both identified a regional trail through Eldorado Canyon State Park as a priority, it seems appropriate that they express their willingness to support the state park in implementing this streamside trail improvement. Closely tied to Issue #1, this concern is more specifically about where one can park a car. It is worth noting that existing users—predominantly climbers and picnickers—typically have a lot of heavy stuff with them and need a parking spot within a reasonable distance of their destination. On the other hand, the trail runners and mountain bikers likely to be attracted to this new regional trail opportunity do not need to park close to the trail head and can cover longer distances quickly, without the need to carry anything with them. Solution B: Develop an Eldorado Springs Shuttle. This has already been explored tentatively by Boulder County, the state park, and others. The idea is to use a remote destination, perhaps one of the lots at the Marshall Mesa trail head, the parking at Fairview High School, or elsewhere, and run a bus from that remote parking to OSMP trailheads along the route, the Eldorado Springs pool, and the state park trailheads. Similar shuttles have been successfully implemented recently by Boulder County for the Hessie trailhead outside of Nederland and by the City of Boulder for the Chautauqua trailhead at the foot of the Flatirons. While this is an excellent solution for the long standing crowding problems in Eldorado Canyon State Park, it is unlikely to be utilized by mountain bikers in particular. Solution C: Create the most attractive possible trail into the State Park. If you don’t want people driving into the state park, give them an alternative to driving. If the alternative is attractive enough, people will use it. There are six OSMP trailheads within a 5 to 25 minute distance of the state park if you are a trail runner or mountain biker, including the parking at the end of CO67 (known as the Ashram Road), the Doudy Draw trailhead, the South Mesa trailhead, the Marshall Mesa trailhead, the Flatirons Vista trailhead, and the Greenbelt Plateau trailhead. If you provide a pleasant, backcountry trail experience for trail runners, equestrians, and mountain bikers to access the state park, many of them will use it. Solution D: Educate trail users on how to access the state park. Most people take the most obvious solution available to them under most circumstances. If accessing the Eldo-to-Walker regional trail and the IPT is billed as a regional trail that should be accessed via a shuttle or from another parking area, people will follow that advice, especially after getting caught in Eldorado Springs traffic the first time they visit. Provide adequate advertising on trails sites like Hiking Project, MTB Project, TrailForks, and various Front Range recreation-related Facebook groups that represent running clubs, sporting groups, and advocacy organizations, and people will go where land managers need them to. The Hessie and Chautauqua shuttles are a testament to the effectiveness of this strategy. While impossible to know for sure, we believe this concern is overblown. Typically, a new trail will receive a lot of attention when it first opens. But this trail is not proposed as a “bike optimized” trail. Bike-optimized trails cater to mountain bikers by constructing trails more interesting to mountain bikers, such as bike-only trails, downhill-only trails, and bike-specific features (jumps, berms, rollers, technical features, and alternate lines). Such bike optimized trails are currently being built nearby in Jefferson County (Dakota Ridge Open Space and White Ranch Open Space), Clear Creek County (Floyd Hill Open Space), and the City of Idaho Springs (Area 28). These bike optimized trail systems may be a regional draw for mountain bikers, but the proposed Eldo-to-Walker trail provides no compelling draw for the casual mountain biker, and may even prove boring in comparison as well as requiring a level of fitness prohibitive to many users. Regional connectivity is the real draw of the IPT and Eldo-to-Walker. The staff-proposed trail connecting Eldorado Canyon State Park to Walker Ranch has an elevation profile that will make most cyclists look elsewhere because the route will require steep mandatory climbing and perhaps even hike-a-bike sections (to be determined). The staff proposal for Eldo-to-Walker includes a significant climb in either direction, requiring real fitness. The Walker Ranch Loop is also typically considered an advanced-to-expert level trail, which would be attractive mainly to advanced mountain bikers. The Eldo-to-Walker trail and the full IPT will be attractive to a different kind of trail user. Yes, it will include mountain bikers, but also trail runners, hikers, equestrians, backpackers, and others. Additionally, it is important to note, as the three agencies have, that the Boulder community has made several explicit decisions not to allow mountain bikes to access most of the trails nearest to the City of Boulder, suggesting the Eldo-to-Walker regional trail as a more appropriate alternative to near-town trail access. 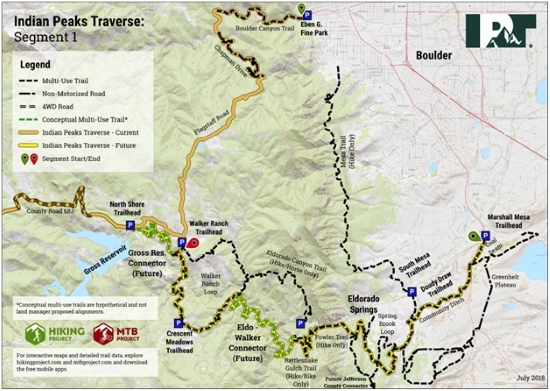 The plans that cite the desirability of an Eldo-to-Walker regional trail include the Boulder Valley Comprehensive Plan, the Boulder County Comprehensive Plan, the OSMP Visitor Master Plan, the OSMP West Trail Study Area (TSA), the OSMP Eldorado Mountain/Doudy Draw TSA, the BCPOS Walker Ranch Management Plan, the State’s 2016-2026 Colorado State Trails Plan, and the state’s Colorado the Beautiful program. We are concerned about the possibility of use conflict. The staff proposal eliminates one of the biggest sources of potential use conflict—sharing uses between non-expert picnickers and higher speed mountain bikers for the first mile or so of the Eldorado Canyon Trail. This first stretch of trail gains nearly 1000 feet from the canyon floor over a very short distance. But the proposal on the table is to keep the existing Eldorado Canyon Trail as a pedestrian-only trail and build a new “parallel” trail that will cross the current trail one time. Problem solved. But there is still the possibility of use conflict on the state park road. Solution E: Implement Solution A (the streamside trail extension) and/or Solution C (opening up other trails leading into OSMP managed lands). 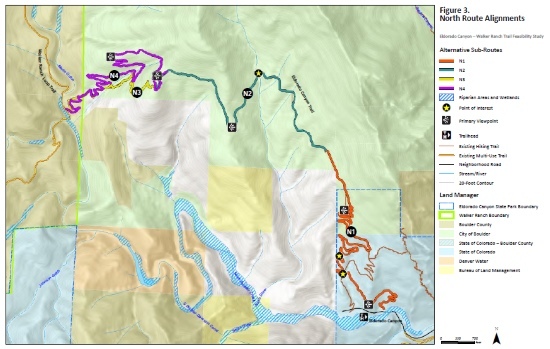 Conflicts on the state park road can be ameliorated with solutions offered above, including trail connections to remote parking. We hope that OSMP and BCPOS understand their crucial role in resolving this issue because they will be an important source of funding and/or management permission to achieve the solutions mentioned here. Notably, BCPOS and OSMP can apply for State Trails Program funding to build trails on their land, but it is our understanding that the state park—ironically—cannot apply for State Trails Program funding (this is the most significant source of funding for trails in Colorado). Collaboration between all three agencies to implement either the political solution of opening OSMP trails or the financial solution of streamside (or both) will be necessary. We hope this thought piece has raised some issues and laid out some facts that you, the reader, have found thought provoking. We also hope this article will lead to a deepening and maturing of the conversation around how to make the Eldo-to-Walker trail and the IPT successful. In the final analysis, we believe that the staff recommendation for an Eldo-to-Walker trail on the north side of the canyon represents an environmentally responsible, win-win solution that will bring political attention and resources to bear on long-standing Eldorado Springs and state park issues while providing a long-sought-after regional trail connection. We remain optimistic and believe that this new trail opportunity will become the most significant improvement to trail-based recreation in Boulder County as the final segment of the IPT.